I don’t really want to vacuum the living room, but I know it has to be done; eventually. I can push it off for an extended amount of time before it becomes a serious problem even though I know it’s not the most tedious task nor will it really take that long. But how about instead of allowing it to be a want to, I turn it into a “have to”. I “have to” do this otherwise my day is not complete. I “have to” do this otherwise I’m not meeting the mark. I “have to” do this otherwise I’m not accomplishing my goals. Just like you “have to” go to work to provide for your family, or you “have to” cook dinner so you’re not starving, we must turn the little tasks of our lives into “have to’s” as well. 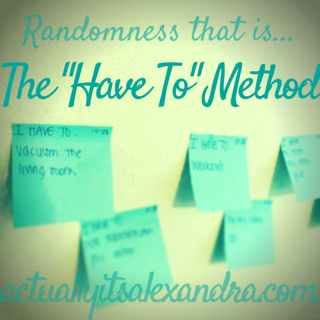 How much more would you accomplish in a day if you turned the want to’s into “have to’s”? How much better would you feel if you were getting rid of those lingering daily tasks? Here’s an example of my “have-to” wall. 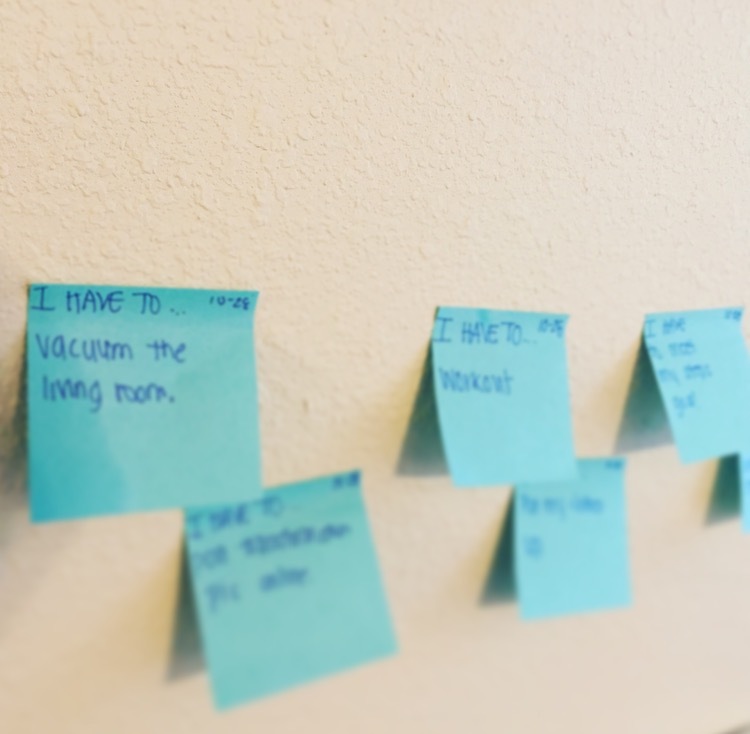 What I like to do is write 5-8 little daily tasks on sticky notes and place them in an annoying place where I’m likely to see them (for me, it’s the middle of the wall above my desk). Don’t just put it in your phone, or write it all on a list on a piece of paper that can easily get piled under other shiz. Put it where you will see it. Put it somewhere it will catch your attention every single time you walk past it. Then, as you complete the tasks, put them in your accomplishment jar. No task is too small to be celebrated. Watch your goals be reached and your accomplishments pile up. Reward yourself when the jar becomes to full. Be mindful of the fact that even if you had a crappy day, you still accomplished so much making it worthwhile. Take charge of your daily life! Let me know if you try it out! And tell me what you think!